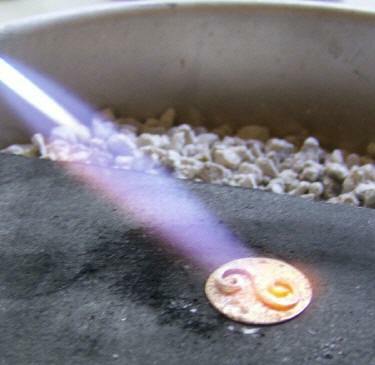 Soldering opens whole new dimensions and possibilities to your jewelry-making repertoire! This fun 6-hour workshop introduces you to the basics of soldering. You'll learn to solder a line, join pieces of sheet metal together, solder rings, a domed piece to a flat piece, learn to attach earring posts and create soldered toggle 'T's. You'll sweat solder and spot solder with precision. 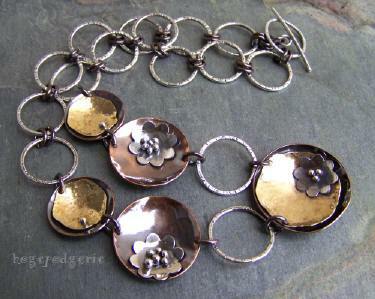 Fusing fine silver and Argentium will also be explored. Space is limited to just 6 students, so you'll get the one-on-one instruction you want in a carefully controlled environment. This workshop is appropriate for those just starting out or for those who have been away from the torch for awhile and want to brush up on their skills. Important: There is no need for you to go out and purchase any tools. All tools necessary for completing the project will be available at the workshop. However, some training venues have a smaller tool inventory than others, which may mean sharing. For that reason, I recommend you bring your own small hand tools (i.e. pliers, cutters, favorite hammer, metal shears, etc.) if you have them. (Note: I usually have quality tools available for purchase at the workshop.) Contact me if you have any questions. The following is a list of tools that we'll be using during the workshop. Each training venue sets its own workshop fees. You'll find contact information for each venue on my Class Schedule page. In addition to the workshop fee, a separate materials fee will be paid at the workshop to cover all materials needed to complete the project. The materials fee includes a full-color step-by-step written tutorial. "Thanks for a great day and a wonderful class"
Return from "Soldering Basics Workshop" page to "Wire & Metal Jewelry Classes" page. Copyright © 2015 - hodgepodgerie. All Rights Reserved. No part of this website, including images, may be copied or reproduced without the express written approval of hodgepodgerie.